Hunting has taken place on the wooded hills around Aldbourne since time immemorial. William I was aware of the area’s attraction shortly after the Conquest when he seized the Manor of Aldbourne from its Saxon lord, Ghida. He designated about 5,000 acres as a royal chase and appointed one, William Waleran, as his Huntsman. Royal hunts took place over the land in the ensuing centuries and there are records of John of Gaunt hunting here both before and after he received the manor in 1365. Rabbits (known as coneys) were bred on the part of the chase designated as a warren and there are many records (notably in 1307 & 1410) of rabbits and venison being received by the court for the King’s table. In the time of King Charles I Aldbourne rabbits were reputed to be the “fattest and sweetest” in the land. William Waleran’s descendants became the Waldron/Walrond family and they appear in the records for more than 500 years. In 1318 William Walrond held the “Bailiwick of the Forest of Aldbourne” and later the “Ranger of the Chase” this latter office was passed from father to son down to 1620. For several centuries the Walronds’ management of the chase appears to have run without problem, but from the time of the Dissolution of the Monasteries the rangers appear to have relaxed their control of the royal lands. 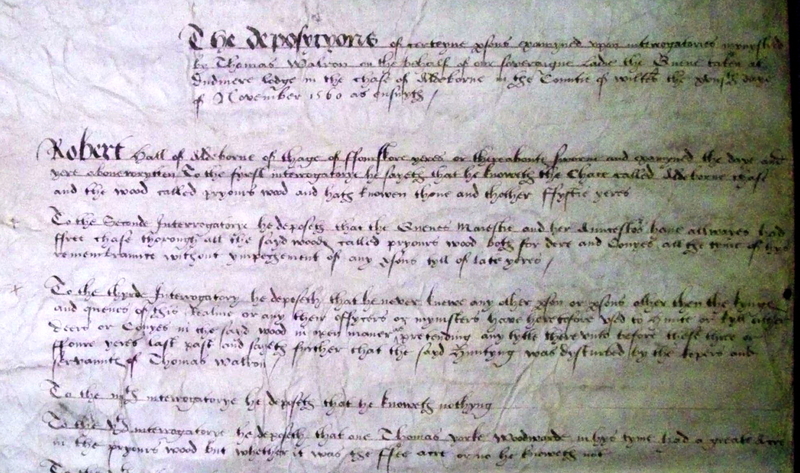 A major dispute arose in the time of Queen Elizabeth and a small extract of the documents which relate to that dispute are illustrated here. It appears that word reached the Queen that unauthorised hunting and trapping was happening on the chase, and that the rights of the manorial tenants (collecting firewood, pasturing pigs in the woods & sheep on the downs) were being illegally assumed by people from Ogbourne St George. An investigation was ordered, the papers for which can be found in the National Archives at Kew (Ref: DL 44/47). The Queen’s officials drew up a list of eleven questions (“interrogatories”) which should be asked to a number of the older villagers to determine the exact situation. Firstly whether you knowe the said Chase of Aldeborne and a wood therin called Pryor’s Wood and how Longe have you knowe the same. 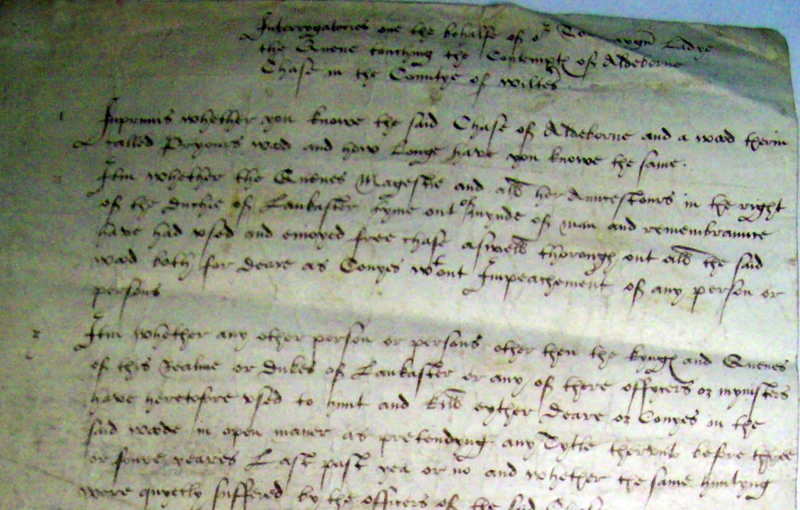 These questions were put to more than a dozen witnesses at several hearings in 1560 and 1561. (A full transcription of the questions and of the answers given by one Aldbourne villager are on the worktop below). Research into the outcome of this case is still continuing. Whatever the outcome of this case the situation over the Chase had become even more clouded. By 1607 members of the Walrond and Goddard families were claiming large parts of the chase as their own, bequeathing royal rights to their heirs and taking deer and rabbits from the chase without reference to their manorial lord King James I. As a result George and Roger Walrond were sued in the Court of Chancery by the Attorney General on behalf of the King. To support the case the Chase was surveyed and the parts in dispute were detailed in a beautiful map now held in the National Archives, a copy of which can be viewed at the Heritage Centre on request.